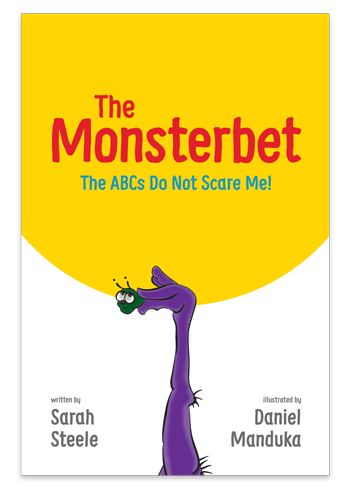 The Monsterbet: The ABCs Do Not Scare Me! Join these twenty-six monsters in your silliest journey through the alphabet yet. Be sure to remind the monsters at every chance you get that….”The ABCs do not scare me!” Creatively illustrated, cleverly rhymed, you’ll walk away from The Monsterbet inspired, happy, and achy (from all that laughing). Warning: while children of all ages always beg for more of The Monsterbet, moms seem to always gag and run away. Dads, give the moms a break, and read this book to your kids. In her second alphabet book, Sarah had to access the gross, slimy, snotty monster region of her brain—a region she hadn’t previously known existed. But once she saw Daniel Manduka’s monster illustrations, she just knew these monsters deserved their own spotlight. With help from her husband (who was once a middle school boy), Sarah has brought these monsters to life, making all kids giggle (and all moms gag).